How can a wordless picture book about a sloth who does absolutely nothing be so funny?! It can, thanks to Ronan Badel’s clever illustrations. Despite what the title suggests, The Lazy Friend is an action-packed story about the adventures of a sleepy sloth and his jungle friends. The sloth’s lazy days are disrupted when his tree is cut down and carted off on a truck, much to the dismay of his friends. A comedy-of-errors unfolds and the sloth sleeps through it all – will the friends get the sloth safely back to the jungle? Will the sloth ever wake up? I’m a huge fan of wordless picture books but it’s quite a feat to make them really funny. Badel nails it with the facial expressions on each of the animals (yes, snakes can look surprised!) and nail-biting moments as the sloth is balanced precariously on the back of the truck and then rushed down the rapids of a crocodile-infested river. Badel uses a predominantly green and brown colour palette which automatically draws your eye to the sloth’s serene, sleeping face – the common element whilst chaos breaks out around him and his friends become increasingly frazzled. The Lazy Friend is a terrific starting point for exploring the issue of endangered ecosystems, however the theme of friendship is at the core of this story. Of course, the real beauty is that kids can tell this story anyway it pleases them. 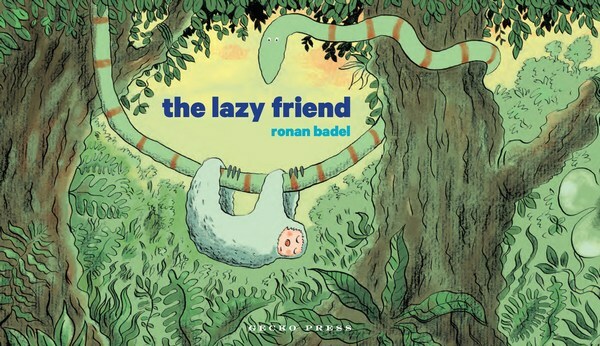 Find The Lazy Friend at Book Depository, with free delivery to Australia. It’s suitable for children aged two years and over.